Its that time of year again and many of you would have seen an email reminding you that its time to submit your application for awards. Audax Australia multi-season Ultra Randonneur or Australian Randonneur Awards you must apply by 20 November, 2018. 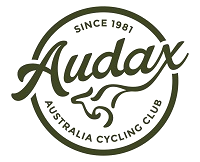 Audax Australia single season awards or the Woodrup 5000 Award are due by 7 December, 2018. An Awards menu has been created on the website to provide a reference and you will find details how to apply there. This is for the current season and will be changed to reflect the 2018-2019 season in the new year. Legendary Stuff – or just another year at Audax Queensland? 275 permanents were ridden for a total homologation of 41,000 km. Congratulations to everyone that participated this year contributing to this outstanding effort. Congratulations to Brian Hornby, Ral Dover, Mark Harris, Jeff Franklin, Tara Horner, Scott McCarthy, David Taylor, Thomas Matyja who all completed the Byron Bay Big Bash. David and Thomas completed their first 600 km brevet. Discussion is underway for the Byron Bay Bash again in August, October, September 2020. Organisers are open to suggestions about a better route through the Gold Coast. Unless you’ve been living in a cave this past week, you will have heard of the passing of Cameron Frewer, father, friend to many, avid cyclist and cycling advocate. He grimly predicted his untimely demise on the roads of Queensland’s Sunshine Coast and his departure has sparked what I and many others hope is a turning point in numbers of senseless and avoidable cycling fatalities Australia wide. Mario Rossin, a great Veronese artist, grew up in Brianza at the Ernesto Colnago school. After setting up his own business, Rossin has created splendid bikes, confirming himself as an authentic master of processing, especially steel. «Veronese di Pressana, born in 1941, but he has always been practicing with great success in the two-wheel sector. On the runner up to the amateur category, Rossin himself prefers to fly over and takes refuge in the Decoubertinian “Important is to participate …” . At the beginning he worked in the welding sector, then particularly important in the construction of very special, just at Colnago, where he refined, with peculiar skills, the trade. He then realizes his experience as a craftsman, in Monza , with his surname as a brand: Rossin. In the mid-70s, together with other partners and with a new corporate configuration, always with Rossin as a brand that widens the field of action, the construction of the bikes is based in a modern workshop in Cavenago Brianza». His stellar but relatively brief career under his own name left us with some great moments in bicycle racing. The Bici group acquired the name in the 90’s and sadly, were unable to achieve sales successes of the past with Carbon bikes bearing the Rossin name. Hennie Kuiper on the way to his 1983 Paris-Roubaix victory on a Rossin Record, the super bike of the day. Kuiper covered 274km at an average 40km/h including crashes and breakdowns. 32 of the 193 starters completed the course that year. Men of steel as well as bikes of steel in those days. “Perth is the most remote city in the world, and this is the most remote twelve hundred in the world” said event organiser Wayne Hickman. ‘Remote’ doesn’t quite cover it: there’s a 135km stage with not a single house, junction, shop, garage, anything. Andrew Preston recounts the 2018 Perth Albany Perth. This is a great read, best done with a good coffee. The forecast for the day of the Yeronga Medley suggested mild weather. I needed to complete the 200km course to gather the requirements for the Nouveau Randonneur. A reasonably flat and gentle ride by Audax standards, what could possibly go wrong? Revisit the 2015 Middle Park Medley with Brian. My sincere apologies to Mark Harris, incorrectly attributed as the author of the deeply insightful VAC management guide. The author of course is Mark Riley. If you are yet to see what all the fuss is about, here’s a brief glimpse. Start at midnight and ride through the Lockyer and Brisbane Valleys to finish on Sunday morning after competing three separate loops at the same place you started in Fernvale. Be part of QLD Audax history by riding the inaugural Midnight Century Brevet Dirt. Start and finish at Fernvale. The Festive Season is upon us again, so grab your bike (along with your family and friends) and join us for a fun-filled ride on the scenic side; Barron Gorge, Redlynch Valley, Copperlode, Edge Hill and Freshwater. Great newsletter! Glad I clicked through for the full experience.